When the light behind my tachometer went, I found it difficult to find a complete reference of how to do this - so here goes! 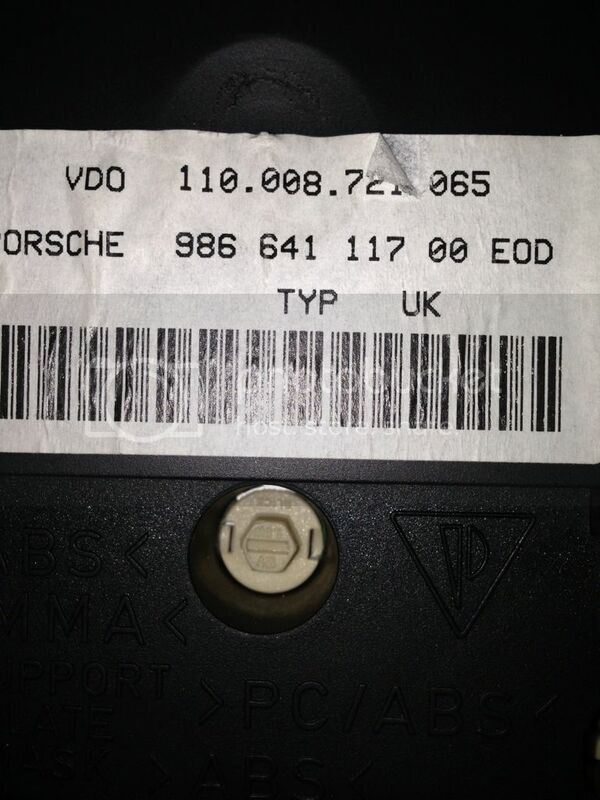 This guide is for my RHD 986 Boxster S - not sure how well it applies to the 987 or LHD! I did the job with the battery connected - if you have any doubts disconnect it. As always, this is a guide and I take no responsiblity for you damaging your car. It worked for me, should work for you - but don't blame me if it doesn't! On that note, let's crack on! 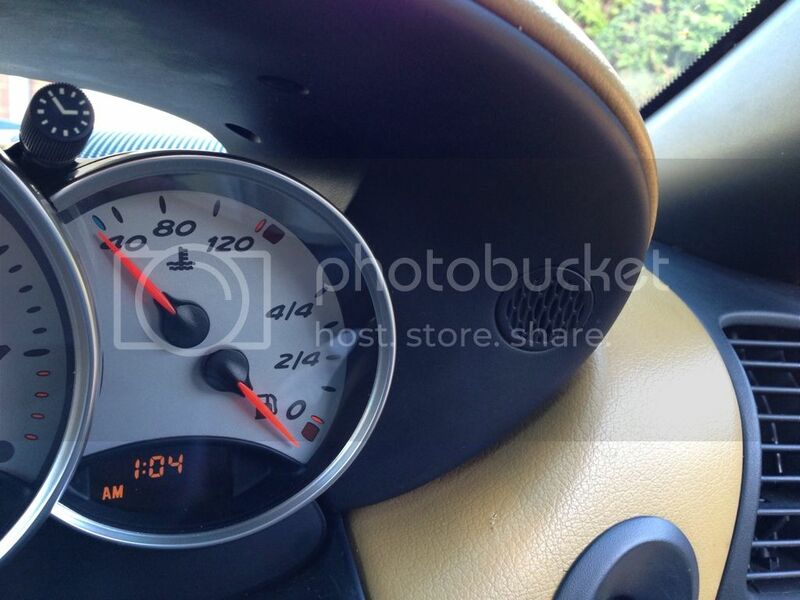 In fact, you will notice my tachometer (rev counter) pointing downwards to 6 o'clock in some of the photos. Proof you need to make sure you don't twist the needles or worse, snap them! Also, not pictured you need a very small flat bladed screwdriver to remove trim and a set of long nosed pliers. Would be beneficial to do this job on a dry day or in the garage. 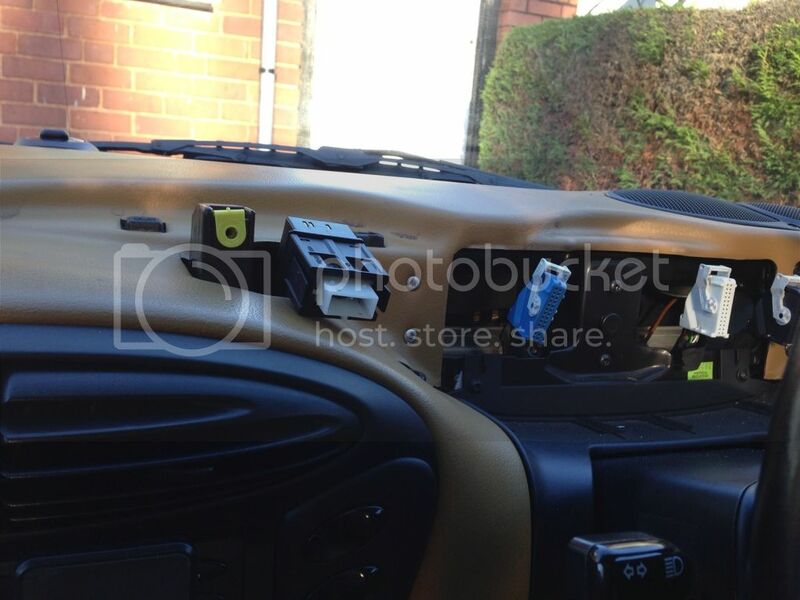 You need to look through the windscreen to disconnect the wiring! 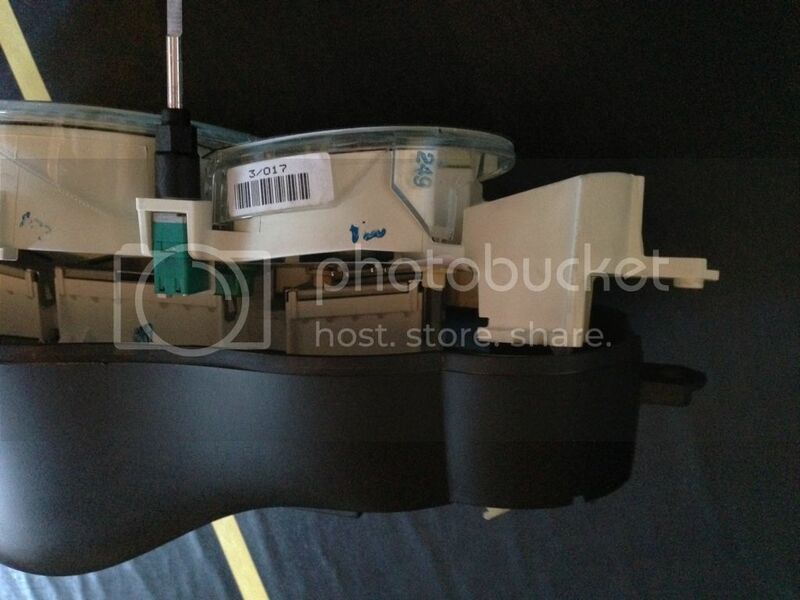 The cluster (or binnacle) is held in with just two Torx T20 screws. 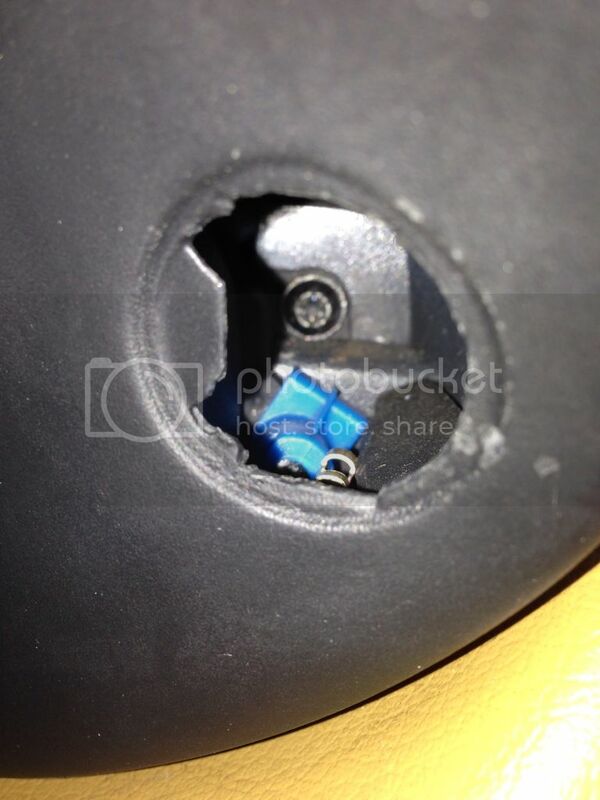 The first is hidden behind the "microphone cover" - simply prise it off with a very small screwdriver. The second behind the hazard warning lights switch - turn on the lights so you can get the screwdriver behind it and prise off. With both screws removed, you now need to remove the hazard warning relay itself. This is simply done by squeezing the grey plastic tabs either side of the relay (shown in the above photo) and grabbing the white of the relay with some long nosed pliers and pulling towards you to remove. Here is a pic of the underside of the removed relay, clearly showing the part number. Remember this when refitting - part number should be down towards the floor. The multiplug the relay plugged into must now be removed. Simply use a flat bladed screwdriver to push it from the top down towards the floor. It just slides right out - there are no clips that hold it tightly - so don't worry about using a little force. All that you need to do now to remove the binnacle is to remove 3 plugs off the rear. 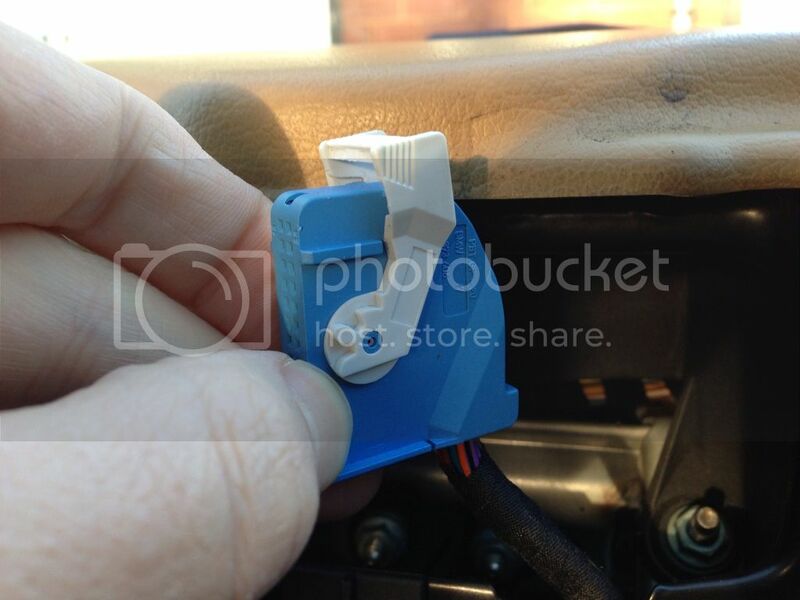 Start with the black plug (nearest the door), then remove the white plug (centre), then the blue (nearest the passenger side). With the stubby screwdriver push in the tab on the plug and slide the white clip over the top of it. 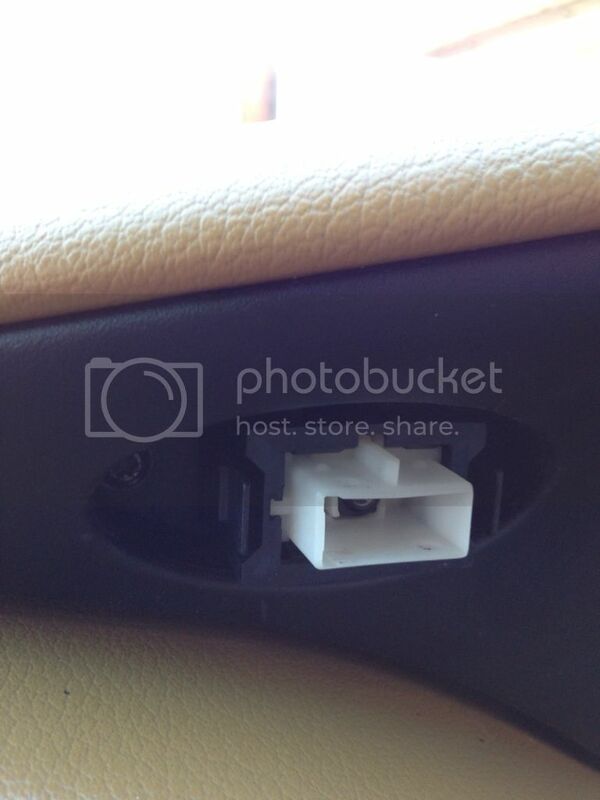 The following photos shows the plugs first in the locked position and then in the unlocked position. With the three plugs removed, the binnacle will lift straight out. Remember those sharp lugs! Pictures with the binnacle out. 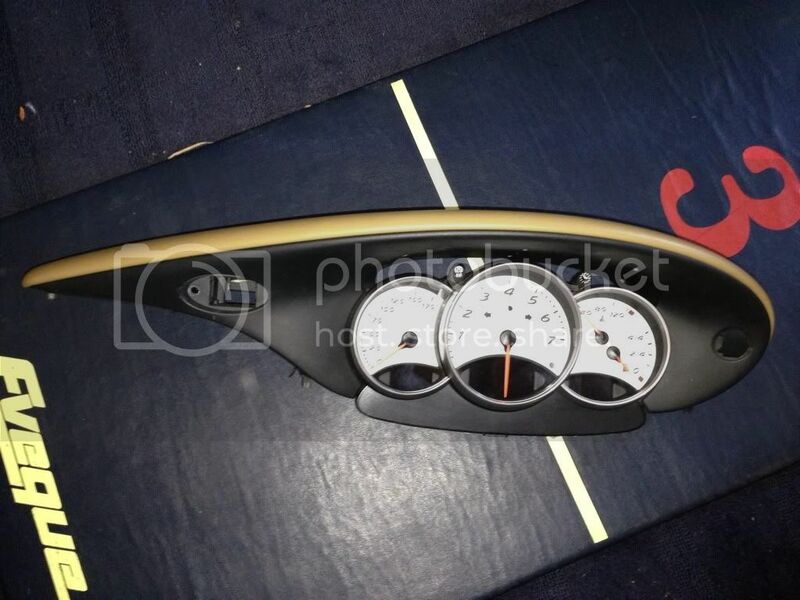 First thing is to remove the instrument cluster from the dashboard cover. 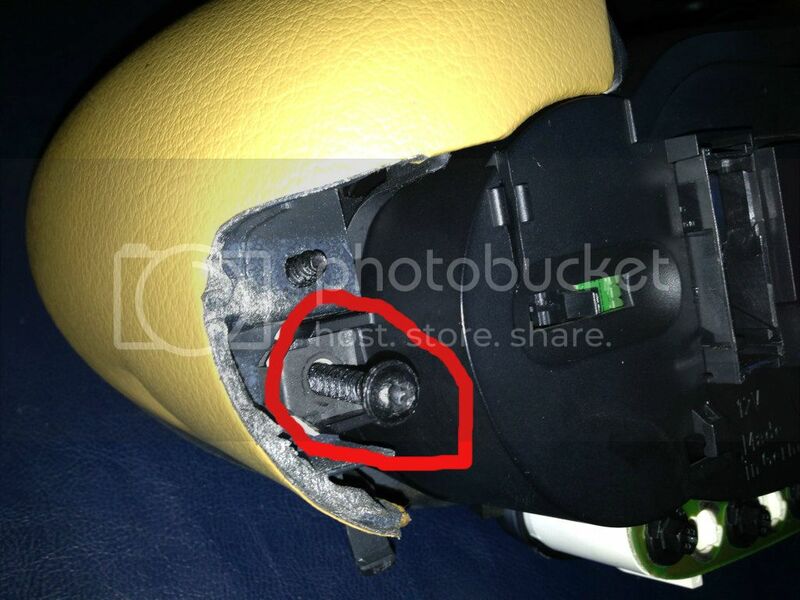 Just remove the two T20 screws shown in the following pictures. Before continuing it is worth appreciating where the bulbs are located so you don't end up doing more than you need to! 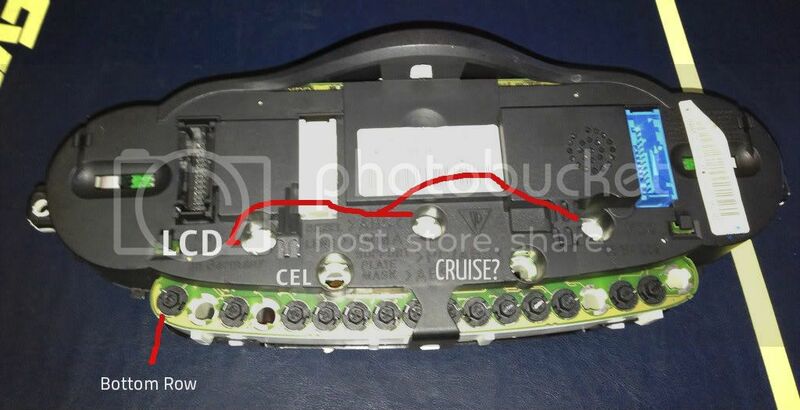 The 3 labelled LCD and the 2 labelled CEL and CRUISE? are the same bulbs. 12v/1.5W (3-way bulb in a beige plastic holder). 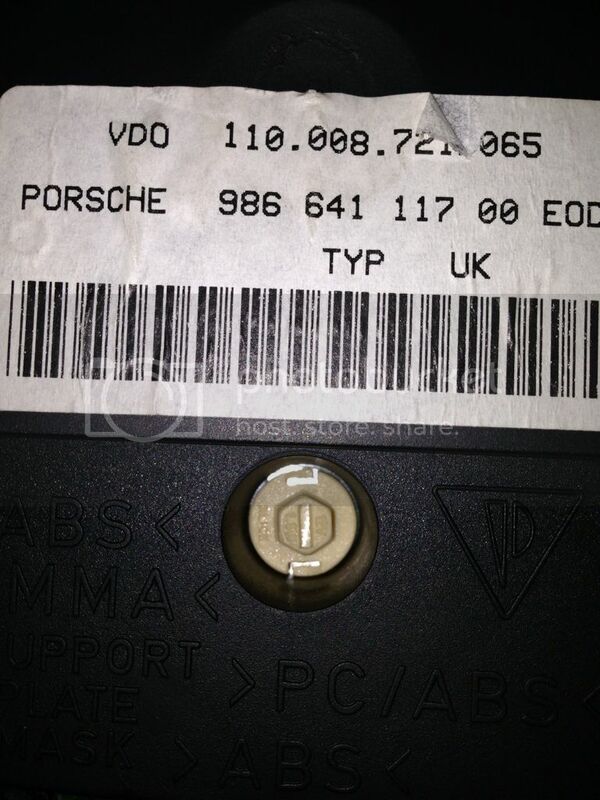 They cost about £1 each from a motor factor or £5 from Porsche. 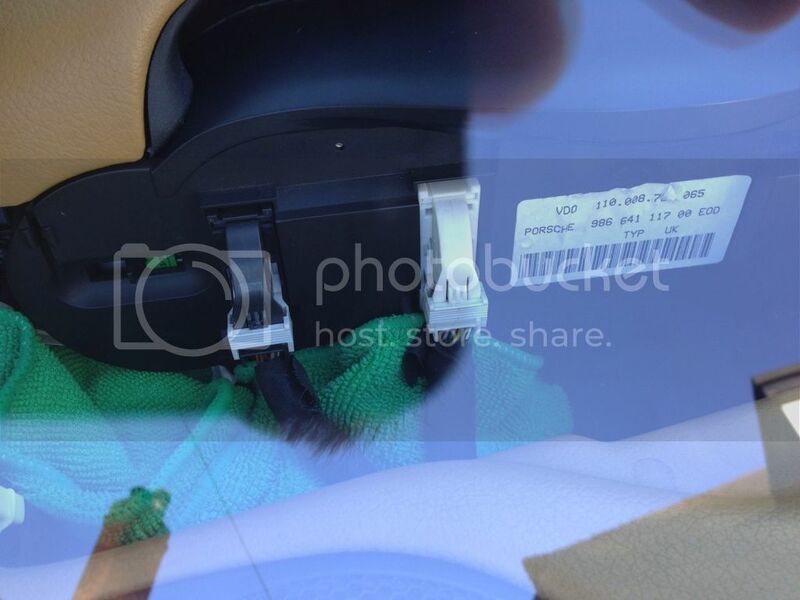 The LCD bulbs are backlighting for the digital displays in the cluster (Trip, digital speedometer, clock). The "Bottom Row" in the diagram are the other warning/information lights. 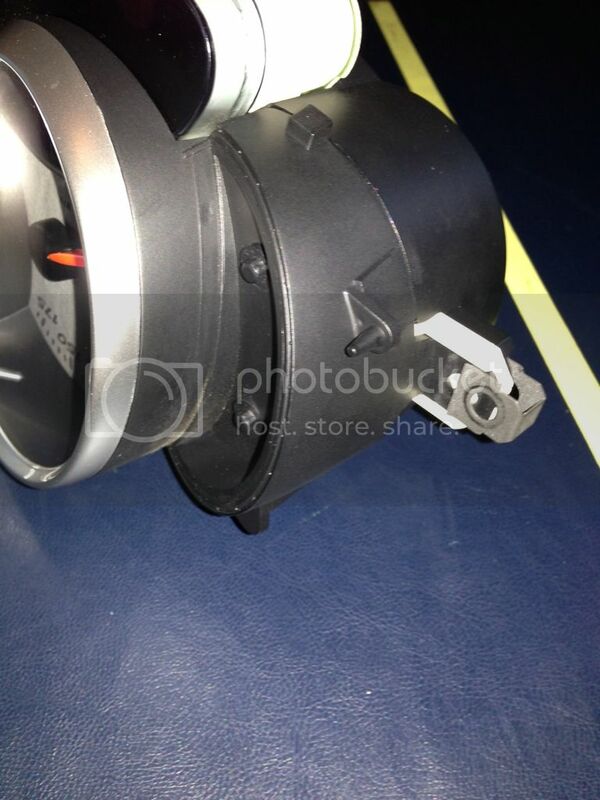 These are 12v/1.2W (3-way bulb in black plastic holder). Again bought anywhere and cost me £1. 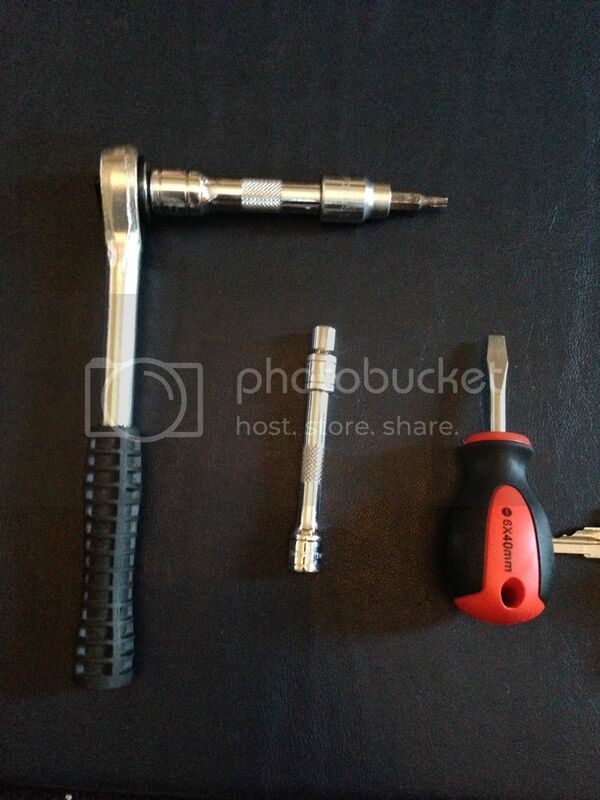 All of the above bulbs can be removed with a screwdriver or (easier) a 6mm hex socket. ... and twist through 90 degrees to lock. If you have bulbs out that illuminate the analogue displays, unfortunately you need to disassemble the cluster - so continue below. I found out how to remove this unecessarily! 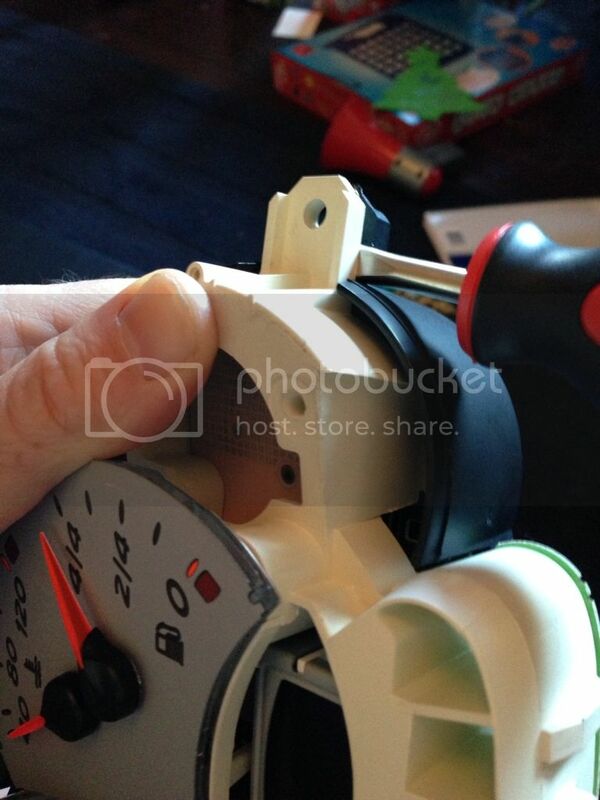 However, there are two tiny bulbs to the left and right of analogue speedo and fuel gauge. They really are tiny bulbs and doubt these will be your problem - but just in case, or you need to remove needles etc. Remove the "clock" and "brightness" rotary switches. They just pull straight off. For reference, a photo showing the correct order for reassembly! 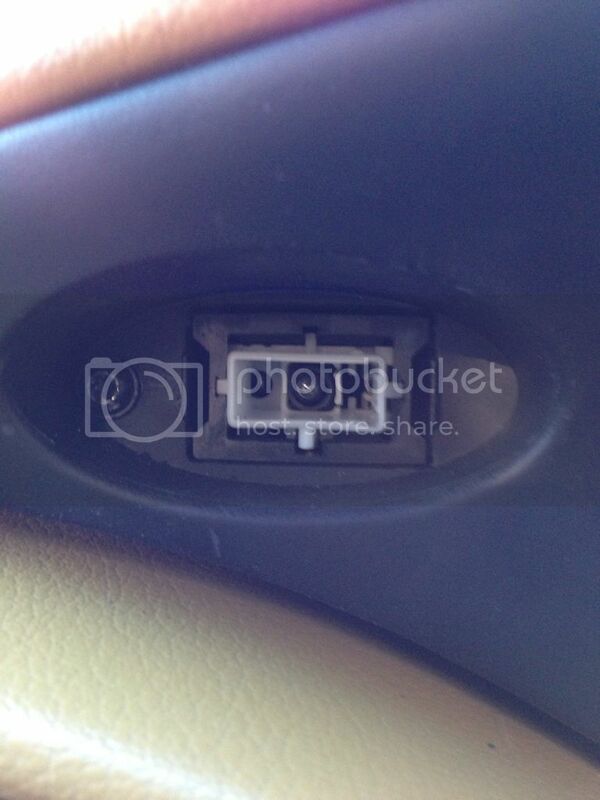 Remove the two metal clips either side of the cluster. Stubby screwdriver is ideal for prising these off. Now let the grey plastic clips on the underside of the cluster go. Not the black one. There is one more clip to let go and it is on the top edge of the cluster -- awkward this so look at the picture. A grey clip, hooks over the white clip you can see in the photo. Patience and a firm push on the clip will remove it - it is not tight. Here is the glass removed. That top clip is to the right of my thumb - so you can see what you are dealing with. With the glass off - be very careful with the needles! You don't want to snap them. If trying to remove, I believe they pull straight up and there is a "special tool". I managed to remove one of mine "accidentally" and fortunately did no damage. Make sure you note where each needle rests if messing here too. When replacing the glass, opposite to removal. Be careful you don't trap a needle - or worse break one! Removing the back of the cluster to expose the bulbs! Remove the two metal clips are per "Removing the glass section" above. 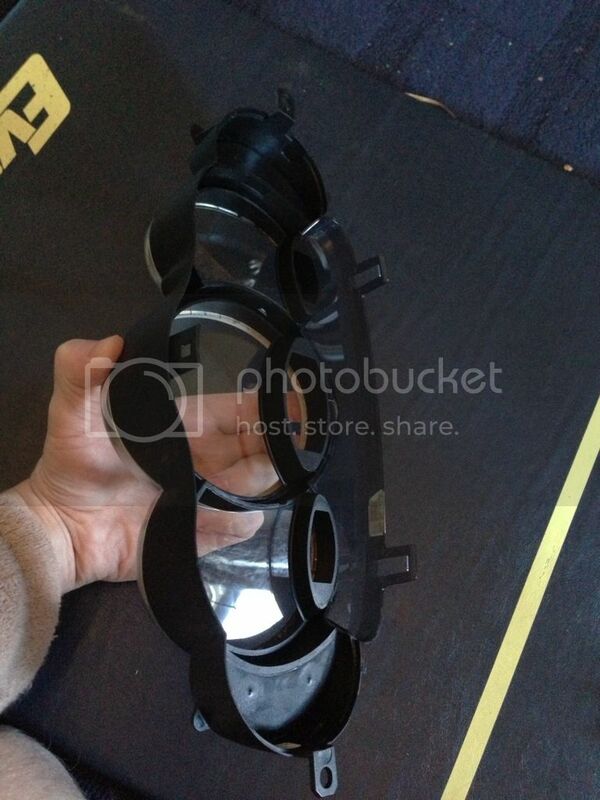 Let the black plastic clip go on the underside of the cluster - pic below. Now you need to be brave. Prise each side of the black plastic cover with your stubby as below. Keep working it and don't be surprised to hear a loud clicking noise! 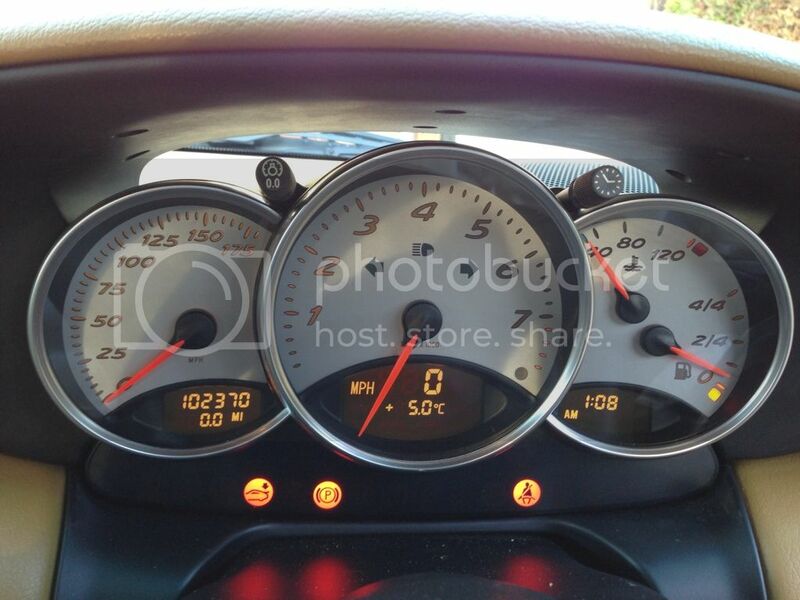 It would appear there are two clips above the temperature gauge and analogue speedo. They will scare the cr*p out of you are they click - seem strong though - so don't be shy. That's it ... only these 3 points that hold the whole back cover on. Be careful as you seperate it. There are ribbon connectors inside and it won't come apart completely. Just enough room to change the bulbs. Inside you'll see 2 x green bulbs. These are 12v/3w but i replaced with a 12v/2.5w (bugger all difference!). Guess what - £1 each. These bulbs pull out of the green holder, unlike the bulbs mentioned earlier. 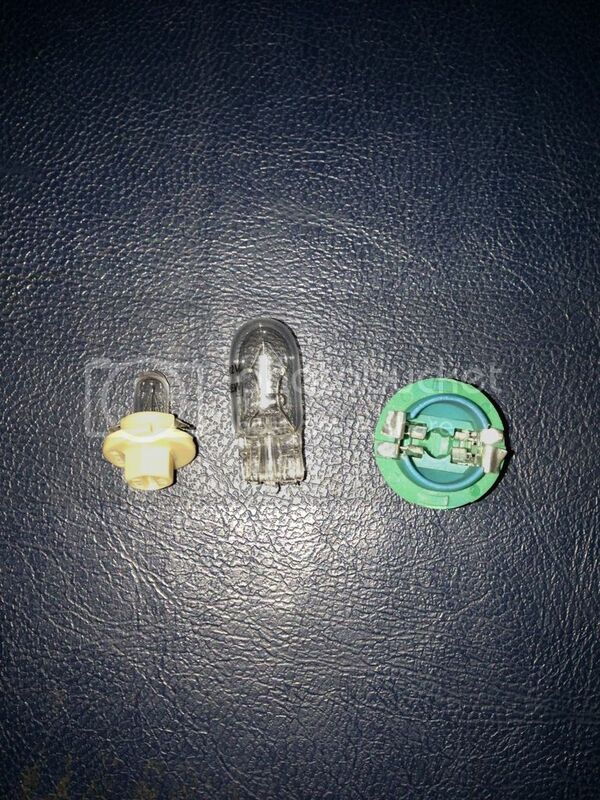 Picture below shows the 3w (2.5w in my case) with the 1.5w bulbs mentioned earlier, side by side. So if your rev counter (tachometer) is looking a little dim to the left or right hand side, it is likely the green bulbs. You will notice looking inside a plethora of the beige 1.5w bulbs for the other dials. On your own here! When replacing the back of the cluster, you need to squeeze hard on the area that is the top of the analogue speedometer and temperature gauge to engage those clips. Careful with the needles! 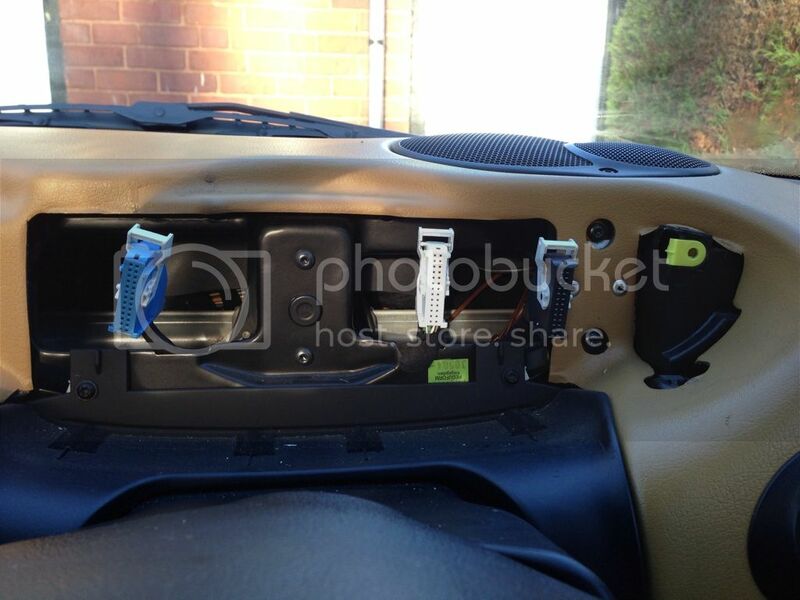 Before Replacing the Dashboard Cover! It would be wise to loosely fit the cluster back in the car now to check all the bulbs work. No point in refitting if you've missed one! So just refit the 3 plugs into the back of the cluster and push the indicator relay back into the multiplug (otherwise indicators won't work). I went for an easy drive at this point to make absolutely sure all was well! If one of your LCD displays is out - don't panic, you've probably not screwed one of the backlights in properly or fitted a duff bulb. Easy - just put the two screws back in - opposite of removal. Pic below with it fully reassembled. 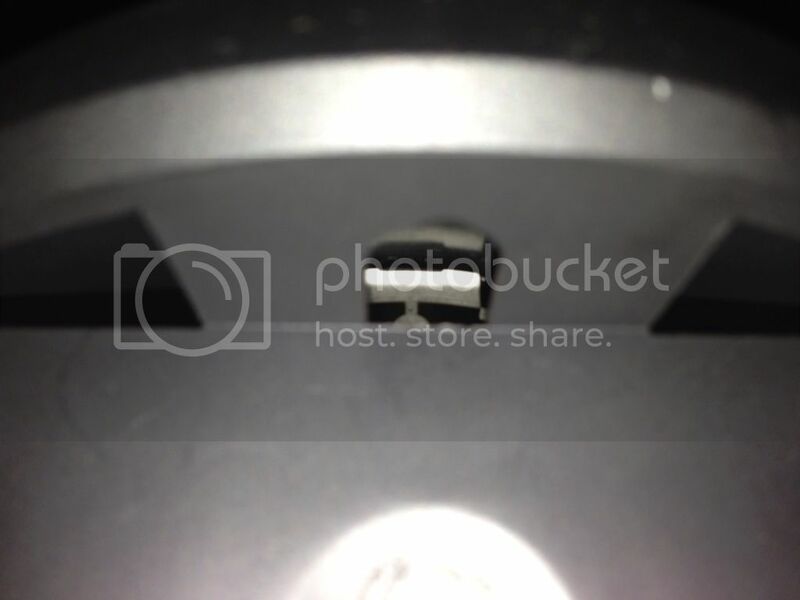 TIP: Put the screw in though the microphone cover hole now! Screw it in about 5mm so it doesn't drop inside the cover whilst refitting! 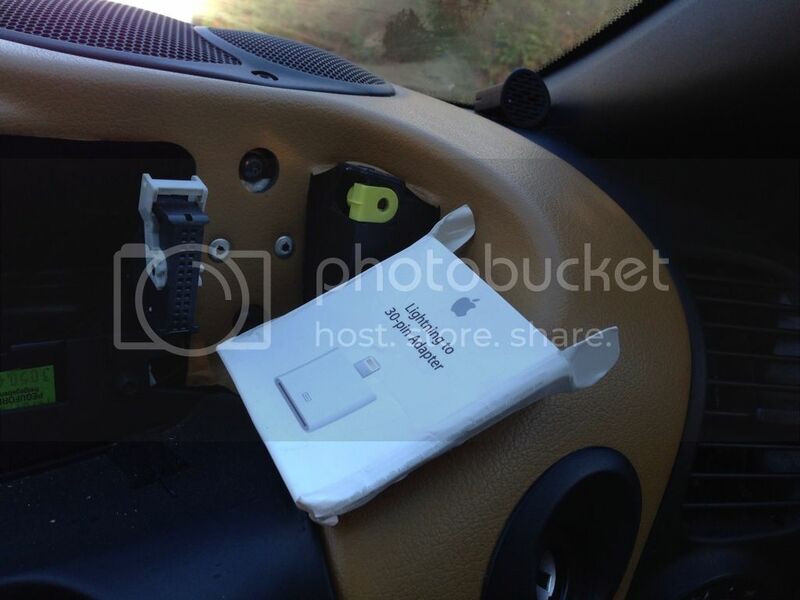 Make sure that cloth or fag packet is still protecting the dash! Lift in the binnacle and slide the multiplug that the indicator (hazard) relay plugs into back into place. It slides from bottom to top - opposite of removal. 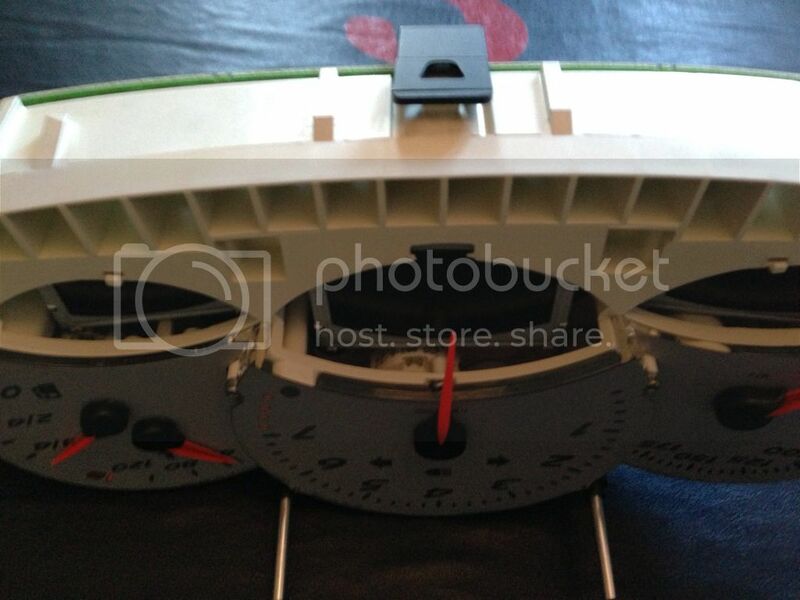 I found it easier to lie the binnacle with dials facing towards the roof while refitting this plug. 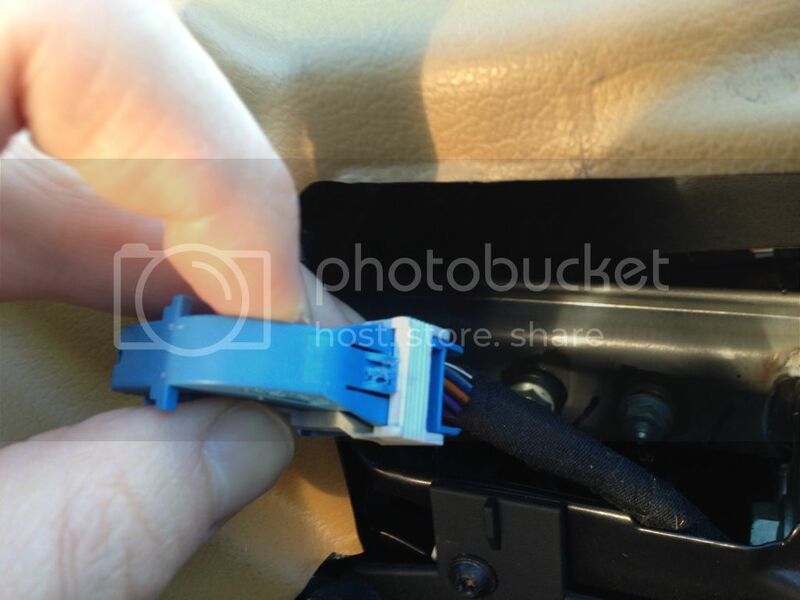 Now reconnect the plugs on the rear of the cluster, in the order blue, white, black. Again opposite of removal. Now push down the binnacle into place ensuring each of the lugs engages. 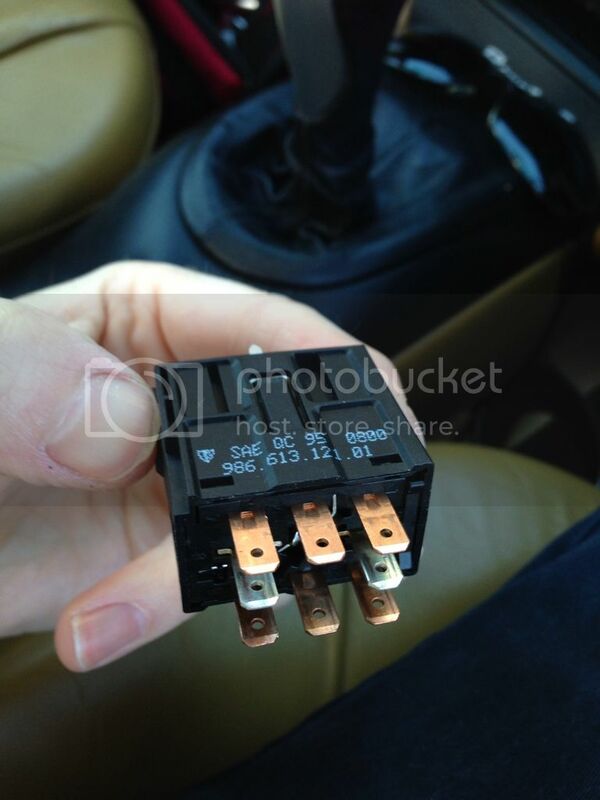 Replace the indicator relay (hazard warning switch). Part number downwards, but it only goes in one way - test it now! 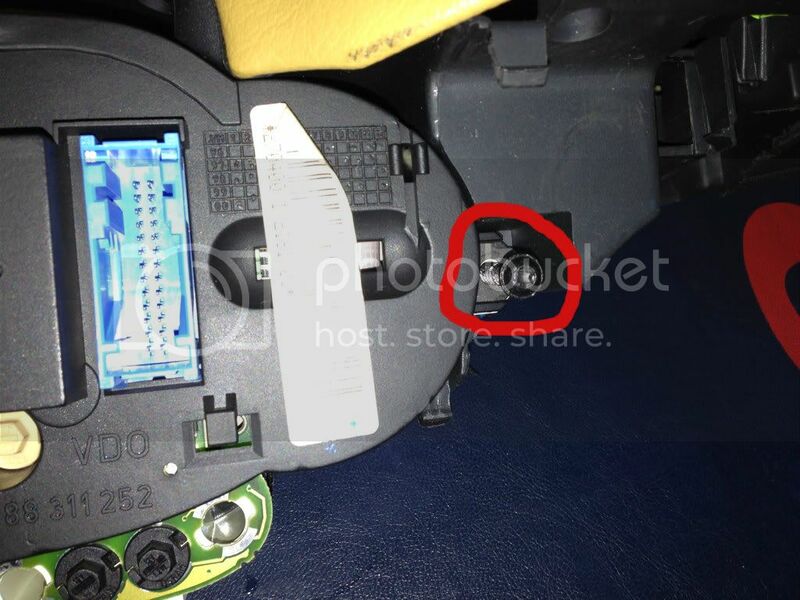 Replace both the screws - the one to the left of the hazard switch and the one behind the microphone cover. Push on the hazard warning switch cover and test. Push on the microphone cover - tip, the part number stamped on the rear faces the fuel gauge. Thanks for the awesome write up, going to follow your instructions to replace my clock and oil gauge bulb on the left hand corner. followng your excellet instructions i swapped out the bulb in about half an hour, big thank you.